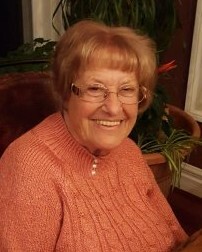 Germaine “Gerry” Cordell, 90, of Falmouth, passed away on Saturday, February 9, 2019 in her home. Gerry was a retired secretary at the Quantico Marine Library. She was a devoted Catholic with great faith and love of the Lord, her family and everyone she touched in her life. She loved nature, camping, hiking and was an avid reader and writer. She was a devoted and loving wife for almost 60 years. She adored her children, grandchildren and great grandchildren. We will remember her charming smile, wonderful personality and warm heart. She is survived by her sons, Bill and wife Juliet, David Cordell and wife Lisa, daughter Michelle Woolf and husband Gregg Woolf; grandchildren Richard Cordell and wife Cari, Patrick Cordell, Daniel Cordell and wife Abigail, Lara Sams and husband Kenneth, Rachel Monk and husband Richard, Christopher Woolf, Natalie Cordell, and Johnathan Cordell; and 14 great grandchildren Christian Cordell, Evelyn Cordell, Jocelyn Cordell, Aubrey Hale, Vanessa Hale, Zander Sams, Camden Gregory Cordell, Grayson Cordell, Caleb Cordell, Brynn Cordell, Quinlyn Cordell, Gavin Sams, Alice Monk and Rose Monk. She was preceded in death by her husband, William Cordell and her son, Gregory Cordell. A service will be held at 6 p.m. on Thursday, February 14 at Covenant Funeral Service, Fredericksburg. The family will receive friends one hour prior to the service. The burial will take place at 11 a.m. on Friday, February 15 at Stonewall Memory Gardens in Manassas.